BlackBerry Mobile is back with a new phone, and the evolution to the KeyOne is called... the Key2, and it's dubbed the 're-imagination of an icon'. Confusing jump to numbers aside, the new handset combines a number of key upgrades that the brand says its previous customers were looking for. 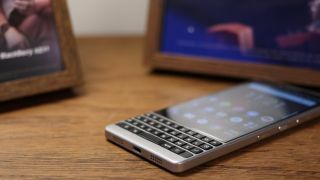 The main changes are to the design: the keyboard is now matte finished (and 20% larger), making it easier to type on, and the phone has a new, more robust metallic rim. The convenience key has moved to near the volume and power button too, to keep things more neatly together. The camera on the back has been boosted to a 12MP dual-sensor effort, which allows for bokeh effects for snaps you're taking. The big change, according to TCL Communication (the licensor of the BB brand), is the Speed Key, a button that functions in the same was Shift or Alt to allow you to open apps speedily. This means Speed+S will open Spotify, Speed+T Twitter and so on... and it's customizable to each user. The software, Android 8.1, is still focused on security, with the Privacy Strip, DTEK app looking for nefarious elements within the phone, a security layer injected into the hardware and the addition of the less-trackable Firefox Focus browser. The spec list is pretty decent for a phone of this caliber: there's 6GB of RAM, 64GB or 128GB of internal storage (with a microSD card slot too) alongside a Snapdragon 660 CPU. The latter spec is probably the least impressive of the set, but at least it's a powerful mid-range effort from Qualcomm and BlackBerry clearly doesn't anticipate people editing heavy video, taking loads of snaps or entering the virtual world with this phone. The 4.5-inch 162- x 1080 display is sharp enough (although an odd aspect ratio to many) and there's a headphone jack too. The BlackBerry Key2 will start at £579 GBP / $649 USD (around AU$1015), and begins shipping globally later in June.